I forgot how dark this film is. It’s actually a pretty creepy movie actually – sort of like a combination of a Twilight Zone episode and a typical live-action Disney film. The kid falls down, wakes up to realize that he’s been missing for 8 years and hasn’t aged, and then he’s taken away from his family that he just reunited with to be tested by the govt and NASA. All this creepy dark stuff happens before he starts his adventures in the spaceship. And there’s even some curse words in this film that wouldn’t be found today in a PG-rated live-action Disney film. Pretty damn good sci-fi film for kids and adults! 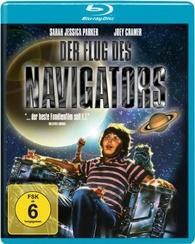 The German Region B blu-ray is excellent quality for a movie that came out in 1986. There are some spots and dirt that pop up, but the video quality is a huge upgrade from the DVD. I have the NTSC DVD as well and I did a side-by-side comparison and the blu-ray video quality really shows a dramatic difference. The DTS-HD 5.1 audio is pretty good as well. It’s pretty active and does a solid job but don’t expect an amazing audio remastering. No complaints at all! Flight of the Navigator is an intelligent movie for kids and still pretty entertaining for adults. It’s certainly the most watchable Sarah Jessica Parker film i’ve seen!